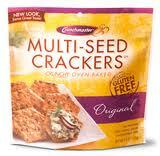 I received a nice box of Crunchmaster Multi-Seed Crackers from the Green Moms Meet Campaign. I was so glad I was chosen for this! They are "oven baked with a blend of sesame, quinoa, flax and amaranth seeds, and are lightly topped with natural seasonings." Right now you can sign up and receive a coupon for $1 off your next purchase of Multi-Seed Crackers or any of their other snacks. My favorite Crunchmaster snack is the Multi-Grain Crisps. My favorite Crunchmaster snack is the Toasted Onion flavor (: Yum!